A personal guide for becoming an authentic leader Whether you are just starting your leadership journey or leading a large organization, The Discover Your True North Fieldbook will help you find your leadership purpose, that internal Compass that provides direction and keeps you oriented your True North. Through a series of reflective exercises, this Fieldbook helps you become a better leader by learning to be a more authentic one. 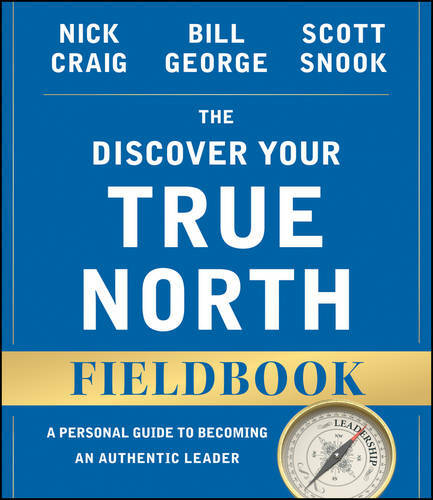 This Fieldbook both personalizes and unlocks the central lessons of its companion book, Discover Your True North by Bill George. It shares the most powerful insights that coauthors Nick Craig, Bill George, and Scott Snook have learned from helping more than 10,000 leaders discover and live up to their fullest potential. Each chapter contains potent exercises that help you mine your life story for deep insights and important patterns. As you work your way through these reflections, you will gain a clearer sense of who you are and why you lead the essence of an authentic leader. We offer an identity-based approach to leader development. Rather than telling you how to lead, the Fieldbook guides you through an intimate process of personal discovery. By understanding your life story and sharpening your personal narrative, you will discover the unique leader you were meant to be. On the way, you will work through the same lessons taught to MBA students at Harvard Business School, as well as senior executives in many Fortune 100 companies. The Discover Your True North Fieldbook will help you: * Become more self-aware and self-accepting * Locate that sweet spot at the intersection of your passions and strengths * Identify and lead from your core values when it matters most * Build a robust support team to guide you through difficult times * Discover your leadership purpose, the essence of who you are, your True North * Stay grounded by integrating all aspects of your life * Grow as a global leader * Help others become authentic leaders To help you actually live your True North, this Fieldbook concludes by offering a rigorous, step-by-step process that generates a customized, behaviorally anchored Personal Leadership Development Plan. This plan not only summarizes and integrates everything you've learned completing this Fieldbook, but does so in a way that supports immediate action and impact. Welcome to your journey toward authentic leadership. Welcome to your True North. Visit www.DiscoverYourTrueNorth.org to learn more.